Today we have been mostly cleaning and fisnishing up. Mattias moved some things around in flash and made the lights in the upper corners of the screen more visible. This is terrible news since all the flash-code was stored there. It turned out, however, that it was a false scare. With the aid of a HP-recovery CD he was able to restore the project (thank god...). Proper back-ups have now been created. Also David sent a mail this morning, basically dumping a load of crap for us to do. We spent some time arguing wether we ought to complain and notify our student-union that he is illegal or just shut up and do it. We ended up chickening out and did his crap. We are very curious how we are supposed to create a website from scratch since no HTML or other language is required from us. Thankfully some of us know it from the past. We (kind of) finished the BONGOlight today. Mattias and Joakim spent the day beautifying the flash-app, Samson wrote some texts (Davids stuff) and Zahra fixed some broken cords with soldering. Basically, we all worked. Hard. 1. Our beautiful bongos. 2. Mattias is coding and Samson is editing photos. 3. Zahra plays the drums. 4. Mattias. Able to see the end of the tunnel. 5. Zahra, overworked. After much fussing about we finally decided we needed to buy a real bongo. We checked the net for prices and bought a "Dadi proffesional percussion" bongo at "Jams" here in Malmö. The rest of the day was spent tweeking and adding to the flash-application and adding graphics. After some advice we decided to skip the visual indication of the lights and instead create graphics for it in flash. We move more and more in to the digital world. Soon not even the bongos will be real... (what a bummer that would be). Samson did some soldering and created a mountable chip to put on the Arduino so every little thing stays in place. All the elctronics have moved into the bongos belly. Now we basically have Bongos that are connected to a laptop, the rest of the work is purely software-oriented. 1. The Bongos. 2. Adding the vibration sensor on the inside 3. We put the arduino on a piece of cardboard. Today we beta-finished writing the functional part of the flash code. Some additional tweaks are needed before we can take this baby out of the garage - but we are moving along. Now, we are aware that most of these landmarks are quite trivial for advanced users but this is our first attempt of anything like this. Mattias and Joakim has had a two week workshop when they toyed around in flash, but thats it. They're is no other previus knowledge between us in these areas, we are flying blind (and googling alot - we actually came up with a catch phrase to use when lesser men ask stupid questions: "How the Hell do you google!?!" or in Swedish "Hur Fan googlar du!?!"). We have added the death counter wich not only makes the bongoplant wither but also allows it to actually die if users neglect the drumming. We also added some basic graphics in flash (grass, flower, etc.). For the most part of the day we have banged our heads against the wall, trying to get flash and the arduino talking via serial port. After looking at some example texts and with some aid from our talented, friendly tobacco-smelling teacher Marcus we reached succes! No IMDB or other help allowed. We also made a circuit scheme today (finally). Now we dont have to go by heart each time we try to build this. Also, we recoded the arduino, dumping ALL previus code and adding the second drum (Bongos have two, remember!) as well as sending serial-data for a nice socket-app to read and send to 127.0.0.1 which in turn allows flash to read it. Bums me out that flash can't read that by itself. Hey macromedia! Save us some time and add the feature. 1. Joakim. Tired. 2. Zahra's got the power 3. Samson, feeling fine. 4.All the bits and pieces. 5. Samson, imitating a frog? 6. Sketchy visualization. 7. Mattias bedroom eyes. 8. Samson got stuck in the wiring. 9. Mattias shows the progress he has made at home, tweaking the code. 10. The connected bits and pieces. 11. Zahra, admiring the wire. 12. bashing our heads in to make flash listen to the Arduino. The graphics are sketchy and so is the movement, but the input is all bongo, baby! The project has finally started going underway. This site has been created and registered and the wheels are turning. The BONGOlight has changed, however. We had been working on the code for the Arduino and had the basis for it ready, but with the change in the idea we are starting almost from scratch. Most of the Arduino-code we wrote have been trashed. 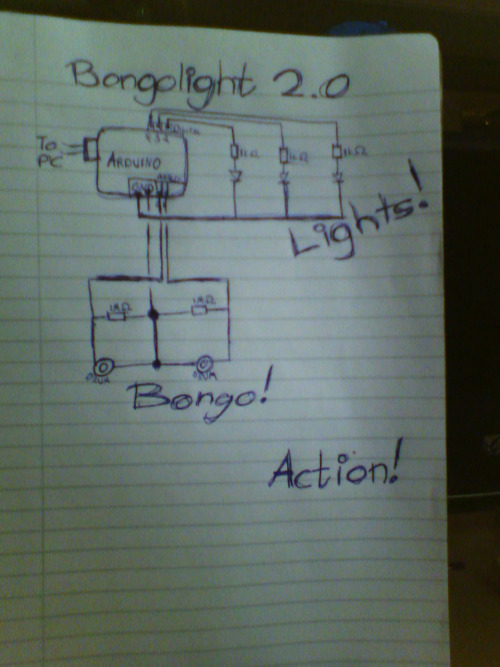 However, the BONGOlight 2.0 (as we are now calling it) isn't heavy code-wise for the Arduino. We have moved from an IRL enviorment to a flashy new domain. The BONGOlight 2.0 is completely digital, it's effect however has become more real than ever before. For further details on the BONGOlight 2.0 read the Prelimenary Info. X and Y. Always X and Y.
about this foto on the blog. Working hardly or hardly working? Two videos of the BONGOlight in its alpha form. Click on sketches for bigger image. A bongodrum-controlled flash-application that allows users to grow an artificial, graphical plant on-screen. The plant grows in different ways depending on the drumming. If the user stops the plant will start to fade. If it fades enough, it dies. The goal is to keep the plant alive during a music-festival. With a collaborative effort in drumming the plant will suffice the terrors of darkness. Perhaps some kind of sponsor deal can keep the drumming interesting. "If the plant is still alive by sunday [company] will donate [sum] dollars to enviormental aid organizations. The BONGOlight 2.0 is constructed of a laptop, running flash and providing the screen (at the festival it might be a secondary bigger screen), an arduino, 3 spotlights, 3 switches for the lights and 2 sensors (for the bongos).